After having taken a look at the product line decisions, product mix decisions need to be discussed. Product mix decisions arise as soon as an organization has several product lines. But what is a product mix, and what product mix decisions are to be taken? Before turning to the product mix decisions, we first have to know what the product mix actually is. 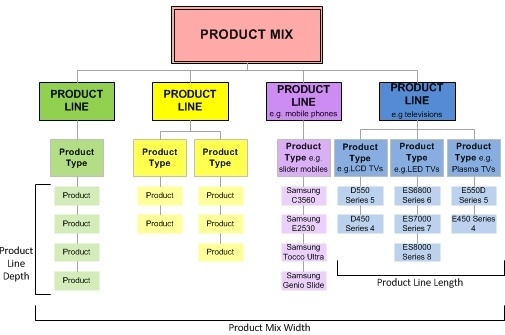 The product mix, also called product portfolio, is the set of all product lines and items that a company offers for sale. For instance, the product mix of Colgate consists of three product lines: oral care, personal care and pet nutrition. Each of these product lines, in turn, consists of several sub-lines. A vehicle manufacturer may have two product lines: motorbikes and cars. Product mix decisions need to be taken for the whole product mix and affect each line. Four important dimensions of a product mix can be identified. These are: width, length, depth, and consistency. The first of the product mix decisions refers to the product mix width. The width is all about the number of different product lines the company carries. As mentioned in the previous example, Colgate has 3 product lines. Thus, it has a rather limited width. The product mix length refers to the total number of items a company carries within the product lines. For instance, Colgate carries several different brands within each line. In Colgate’s oral care product line, several different categories of toothpastes can be identified. A car manufacturer may have several series in its car product line, such as 3-series, 5-series, and 7-series. The next one of the product mix decisions is the product mix depth. It refers to the number of versions offered for each product in the product line. For instance, Colgate toothpastes come in several tastes and variations. The vehicle manufacturer’s 3-series in the car product line may be offered in several versions: convertible, coupé, sedan, and so further. Finally, the consistency of a product mix completes our four product mix decisions. Consistency refers to how closely related the product lines are in terms of end use, production requirements, distribution channels or any other way. In Colgate’s case, we can observe a rather strong consistency, which is based on the fact that all product lines constitute consumer products and go through the same distribution channels. The vehicle manufacturer also has a relatively consistent product mix, since both product lines contain consumer-vehicles, can be sold in the same way etc. Certainly, these four product mix decisions are interrelated. We can identify four ways in which a company can increase its business on basis of the four product mix decisions determined above. Add new product lines à widen the product mix. New lines benefit from and build on the company’s reputation in its other lines. Lengthen the existing product lines. More items in the product lines may result in a more full-line company. Add more versions of each product à Deepen the product mix. Make product lines more consistent (or less). This depends on whether the company wants to have a strong reputation in a single field or in several fields of business. As you can see, the four product mix decisions are more than a strategic issue that has some impact on the company’s success. To be precise, the product mix is one of the most critical instruments the company has. It is the centre of its offerings. Therefore, the right product mix decisions should be taken, in line with customer needs. Since customer needs may change rapidly, product mix decisions need to be taken more than once at the beginning – product mix decisions are part of an ongoing process. Only if product mix decisions are taken on an ongoing basis, maximum value for customers can be created.